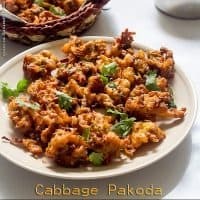 Cabbage pakoda | cabbage pakora recipe is the Indian fritters recipe in which cabbage is mixed with onion, gram flour and deep fried in oil. 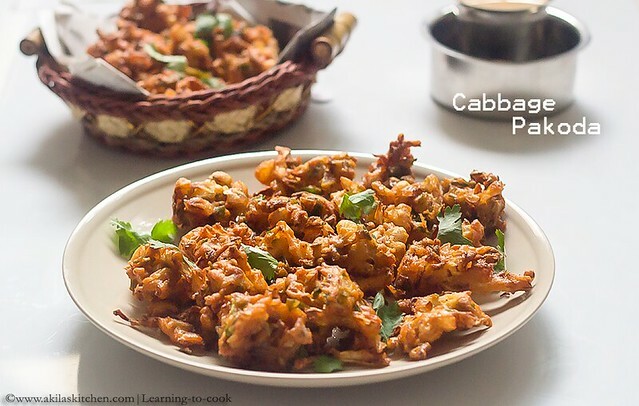 Cabbage pakoda | Cabbage pakora recipe with easy step by step instrucitons for your easy understanding and learning. Cabbage Pakoda or Cabbage pakora is an easy evening snack. My hubby, bought 1 kg of big cabbage last week. After scolding him😒 for buying so much big cabbage, i prepared cabbage sambar, cabbage poriyal, but still i had another 1/2 kg of cabbage. So while browsing for some recipes, i saw this cabbage pakora in one of the site and tried the same method, as we do for onion pakora. It came out as a crispy snack and I am happy😜 that I finished my cabbage finally. 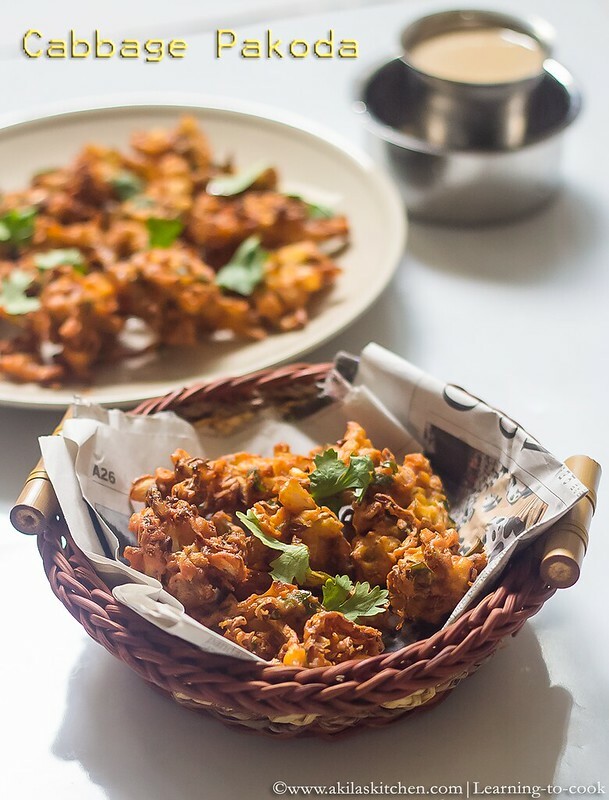 I normally prepare the cauliflower pakora or the crispy cauliflower fry as evening snack and this cabbage pakora has now become one of our family favorite ☺️ . 1. Chop the cabbage lengthwise. Add the ingredients from Cabbage to salt and mix them together. 2. Sprinkle little water tsp by tsp and mix them well, until they form a dough like consistency as shown bellow. Leave it for 5 min to rest. 3. Heat the oil in medium flame. Take little portion of the pakoda dough and fry in the oil. Do the same for the rest of the dough. When the pakoda becomes light brown in colour on all the sides, remove from oil and filter the excess oil. 4. Serve it hot with a cup of tea or coffee. Any mint chutney or tomato sauce would be a great accompaniment. Chop the cabbage lengthwise. Add the ingredients from Cabbage to salt and mix them together. Sprinkle little water tsp by tsp and mix them well, until they form a dough like consistency as shown bellow. Leave it for 5 min to rest. Heat the oil in medium flame. Take little portion of the pakoda dough and fry in the oil. Do the same for the rest of the dough. When the pakoda becomes light brown in colour on all the sides, remove from oil and filter the excess oil. Serve it hot with a cup of tea or coffee. Any mint chutney or tomato sauce would be a great accompaniment. *Post first publised on April 19th 2014. Updated with recipe. Looks simply delicious and crispy looking cabbage fritters. Looks crispy and yummy. 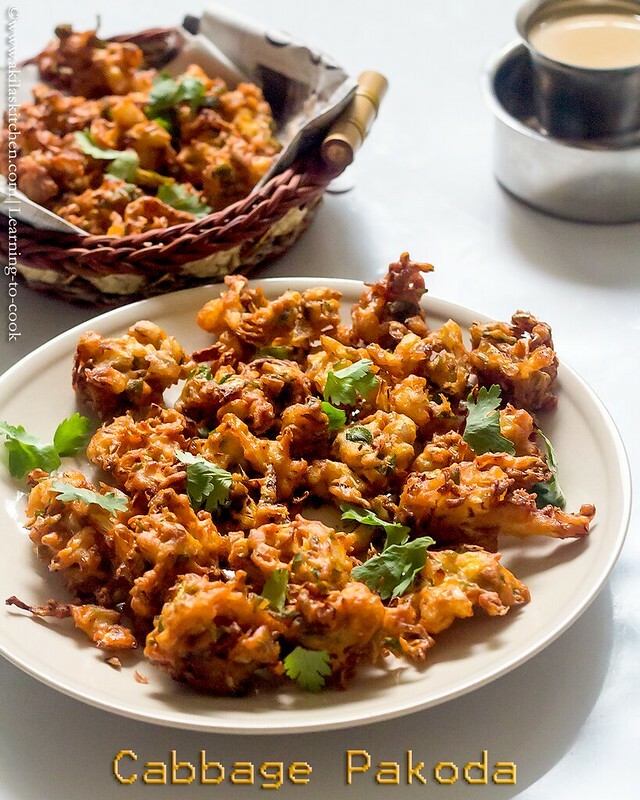 Pakoras. Good to munch. looks so crispy, have to try this soon with my tea. 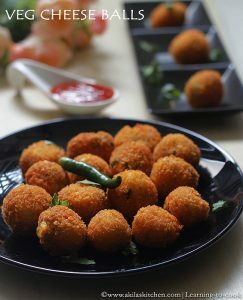 i had this pakoras at my friends place but not sure abt the recipe .this look awesome .i can munch them with a hot cup of tea . Love the invention and love, love the outcome. Thanks so much for the recipe; something I can replicate for our meatless days.